While many will be familiar with 1960 Ford racing programmes using the very compact, pushrod Small Block V8, few know the facts behind the technology at Ford during this time. This book gives insight into the confident, logical approach of engineers working at Ford’s Engine & Foundry Division – engineers who made outstanding technical decisions, leading to many major events being won using larger capacity derivatives of the 1961 221ci Small Block V8 production engine, introduced by Ford mid-1961 for fitting into 1962-model year intermediate Fairlanes and Mercurys. Few appreciate how rapidly the Ford small block Fairlane V8 engines evolved from passenger car engines to highly successful racing engines. Initially, in May 1960, a team of nine engineers, lead by George Stirrat, designed a lightweight, all cast-iron, compact, reliable and durable power-plant for passenger cars, but following its introduction in July 1961, Ford’s engineers quickly realised its potential benefits if modified for racing applications. Within three months, the capacity had been increased from 221ci to 260ci, and by early 1962 Carroll Shelby had fitted a High Performance 260ci version in his AC Cobra. Subsequently, the original design team began work on a second capacity increase, to achieve a High Performance 289ci unit – and within three months the standard 289ci became available. Carroll Shelby went on to win the 1965 World Sports Car Championship using a HP-289ci. Aluminium block and cylinder head pushrod versions, designed in late 1962, had been constructed by early 1963, in preparation for that year’s Indianapolis 500, and the DOHC four-valve per cylinder 255ci raced in the 1964 and 1965 Indy 500, winning the latter outright. The 302ci replaced the 289ci for the 1968 car model year and, at Le Mans in 1968 and 1969, GT40 cars won outright using this variant of the small block. In 1965, 1966 and 1967, HP-289ci-powered Mustangs won the SCCA B-Production Championship and 1966 and 1967 Trans-Am Championships. A Bud Moore Engineering Boss 302 Mustang won the 1970 Trans-Am Championship. Ford invested much time and expertise into its racing activities in the 1960s, and there’s little doubt that the V8 Small Block engines took the company to the forefront of the racing world, until it withdrew from the sport in 1970. 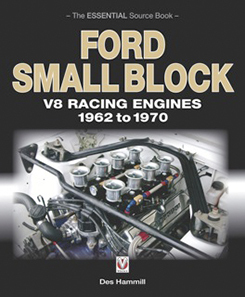 Becoming aware of the lack of Ford Small Block V8 engine information available to the general public, Des Hammill, who has been building racing engines since 1984 (including Small Block V8 Fords), began researching the subject in 1998. During his investigations, he tracked down and spoke regularly with engineers and engine designers employed at Ford between 1950 and 2005, who furnished him with accurate design and development details of these iconic engines.